Death and dying are the last taboos. 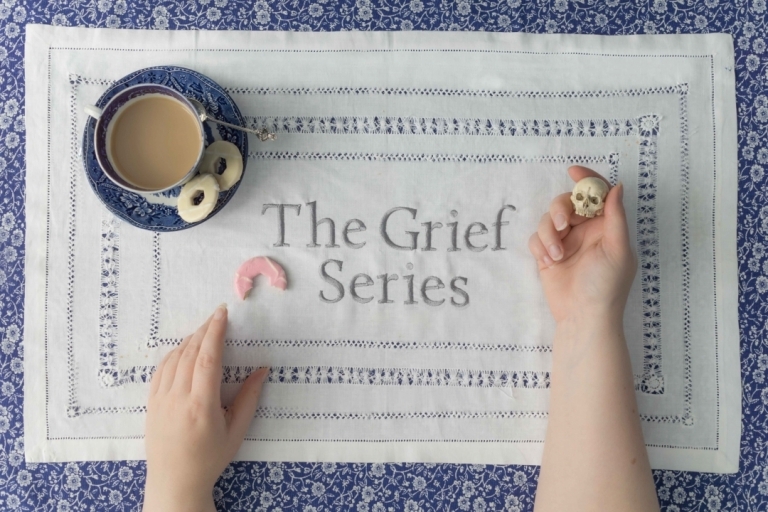 Leeds artist ELLIE HARRISON has turned her experience of bereavement into THE GRIEF SERIES; as she tells RICHARD HORSMAN, it’s a sequence of seven projects inspired by seven stages of grief from denial to acceptance. People react to the loss of a loved one in different ways. Some will lock themselves away, whilst others will throw themselves into distracting activities. 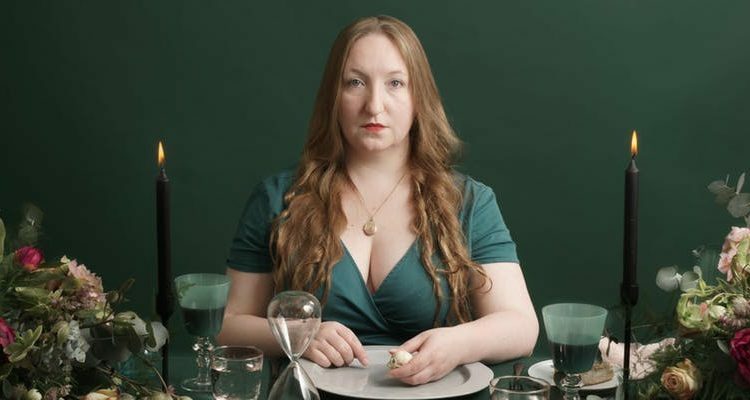 For Leeds artist and performance maker Ellie Harrison, the deaths of her parents and of her brother prompted her into creative activity. “I use my own experiences of bereavement, of course I do” Ellie says in The Grief Series manifesto. “But it is not just about me. I don’t want the work to be a form of public therapy for me and yet I am not resistant to the possibility of therapeutic by products, as long as the work remains open and relevant. 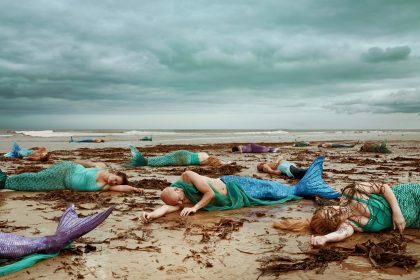 The project is based around a popular model of the seven stages of grief, taken from psychology. Initial shock and denial, a numbness and blocking of the death, gives way to pain and guilt; then comes anger at the unfairness of the loss, and irrational bargaining – a willingness to do anything to bring the loved one back. The fourth stage brings depression, reflection and loneliness before an upward turn in the emotions; there’s a period of reconstruction and working through the crisis, before finally arriving at acceptance of the situation and a hope of life continuing, albeit in a new way without the person who is gone. The first five parts of The Grief Series have already happened. Part 1, Etiquette of Grief was a solo show which toured in the UK and Europe, Part 2, The Reservation was a bespoke and intimate one to one performance made for hotel rooms in collaboration with Jaye Kearney, Part 3, What is Left? was a participatory portraiture project, exhibited in empty houses, made in collaboration with Roshana Rubin Mayhew and 50 portrait sitters. Some of this work is currently on show at Abbey House Museum. Part 4, ‘The Unfair‘ was a Funfair experience for public spaces made in collaboration with Adam Young and Bethany Wells, whilst Part 5, ‘The Crossing‘ is a collection of interactive resources to facilitate planning a funeral celebration created in collaboration with Matthew Bellwood and illustrated by Fergus Dunnet. Ellie is just about the embark on Part 6 – ‘Journey With Absent Friends’ which will take a caravan packed with memories to sites in the UK and Europe which had a special significance for the loved ones she has lost. The journey will be punctuated with meal events combining beautiful design, great food and immersive performance plus the chance for the visitor to to remember people they have lost. Travelling between sites of personal remembrance, Ellie will be stopping at arts centres, museums, beer gardens and maybe even the occasional service station. Visitors can add memories to an audio archive or embroidered map, have a cuppa and spend time exploring a caravan full of hidden treasures. The caravan is free and open to people of all ages. Ellie sets off on her caravan tour this coming weekend; the Dinner With Absent Friends arranged at the Abbey House Museum is now sold out, but she returns to Kirkstall Abbey on Sunday 24 June for a Picnic With Absent Friends. This event will welcome Ellie home after her month-long journey with a caravan full of hidden treasures .. visitors are invited to bring a picnic from home or order a bespoke designed hamper with beautifully crafted stories and treats from The Swine That Dines. Those attending can contribute a favourite handed down recipe to a book, hear reflections on the journey and raise a glass to absent friends. Lighthouse, Poole: 6th, 7th & 9th June – Book for the meal on Saturday 9th, 1.30pm. Next Post:MUSIC │ Opera North’s Kiss Me, Kate is Simply Wunderbar!